Ever Ours is one of my favourite websites, partly because Kim is my Irn Bru-loving sista from anotha mista and partly because everything on the website's pretty perfect, so when she asked if I'd like to pick a piece from the new collection my answer was a big fat yes. I finally decided to go for this lovely blouse and when it arrived I was over the moon to find out Kim had sneaked in this amazing lion necklace too, the cheeky wee sneaky she is. A whole load of new arrivals have just hit the website so make sure and check them out. I've also got on my first ever pair of Cheap Monday jeans which was a bit of a treat for my legs. I still swear by my Primark £8 pair but it's nice to have these ones for special occasions as the fit's just that wee bit better and they're as black as a black thing, whereas my Primark pair are looking a bit sad and grey. Be Boutique also have the black ombre jeans in stock which I know a lot of people have been after - you can find them here. Well, I'm off to get drunk and play pool with Rob, Happy V day amigos! I love the top! Seriously need your wardrobe! I love that blouse and the jeans and the scarf and the jacket. I just love the whole shebang! Ahh i love Everours so many lovely little gems!! happy valentines day, I love this outfit! love your scarf and necklace! Amazing outfit, especially love the shirt, necklace and scarf! You're always so pretty :) Love the scarf with this! Amy you can't do any wrong with outfits! You're so rock! Love your style! Wonderful outfit! I like that the emphasis is on the scarf! 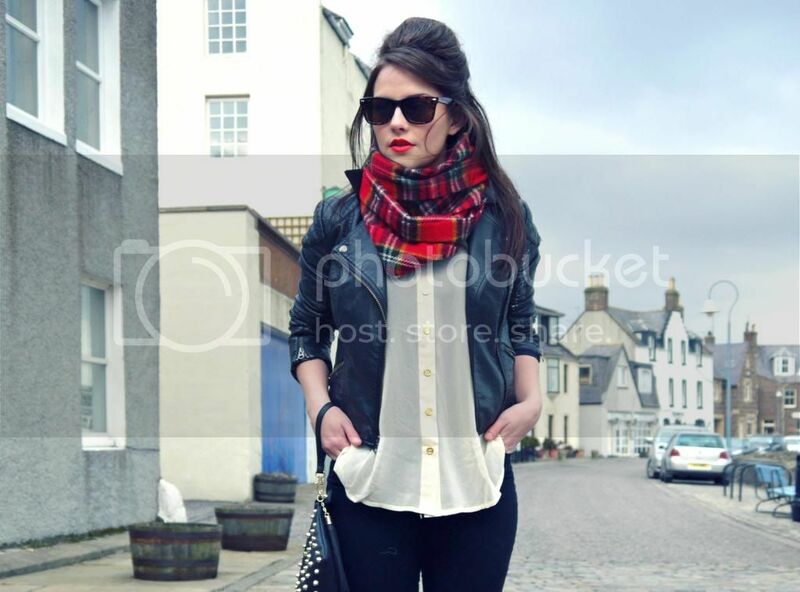 Love the addition of tartan, great outfit! Be great if you could check my latest outfit post feat a camo jacket from Fashion Union.